The Penthouse is THE selec t apartment in the Harveys Dock development of new self-contained holiday homes. Sited on the corner of the development, on the top floor, youll have sweeping dual aspect views from the huge balcony. Looking directly out onto and along the unspoilt Blackwater River valley to the mountains beyond lismore, and round to the sea, the beaches and lighthouse. Harveys Dock is sited right in the centre of Youghal, between the two fishermens quays. This development of 34 quality apartments, has private parking and onsite management. There are no lifts in the development. The Shops, Restauarants, Pubs and facilities of the historic town of Youghal are just yards away. Youghal is a most historic and interesting town situated at the mouth of the Blackwater River, one of Irelands best known salmon fishing rivers. Youghal renowned for its Blue Flag beaches, and is a favourite seaside destination. There is no shortage of outdoor and indoor activities for all age groups. Fishing trips and leisure boats are readily available for hire. There are many attractive picnic areas and scenic drives in and around Youghal including Fota Wildlife Park, House and Arboretum, Blarney CastleJameson heritage cenrtre, Lismore, Ballycotton and of course Cork City. 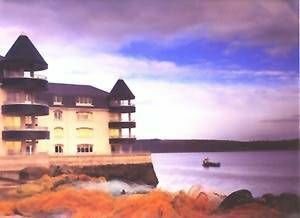 You can enjoy beautiful beaches, sailing, canoeing and boating, wind-surfing, a magnificent 18-hole golf course and pitch and putt, 4 hard-court tennis courts, greyhound racing, guided Heritage walking tours, excellent restaurants, and nightly entertainment of Irish music, cinema, or sing and dance in hospitable pubs. Youghal is a very historic town, much of the 800 year walls still stand. As does the impressive clock gate - a four story tower that straddles the main route into the town. Sir Walter Raleigh was once a resident, and its said he introduced the potato to Ireland here. One of the daily walking tours is a must, and they leave from the Tourist office that is less than 100 yards from the Penthouse. Youghal is famed for its seafood, caught and landed locally in the small town quay. Locally caught and smoked wild salmon is always available. But many other specialities come and go with the seasons. Take care to ask about the specials that day. There are an array of restaurants catering for all tastes from the traditional to the exotic. The finest restaurant in town (and Ireland) is Ahernes the famous seafood restaurant - no visit to Youghal would be complete without dining in Ahernes at least once. The dual aspect views of the Blackwater river, Youghal harbour and the sea, are simply spectacular. The Penthouse is beautifully decorated throughout, to make it an ideal holiday retreat for a small family group or the base for a visiting VIP on a business trip. The Penthouse is usually self -catering, but meals can be arranged from the famous Ahernes Restaurant - as the The Penthouse is owned by the same family.